Archbishop of Warsaw, Cardinal Kazimierz Nycz, led the faithful in prayer on Maundy Thursday, washing and kissing the feet of twelve elderly men at St. John's Cathedral. The solemn ritual, which was echoed by bishops at cathedrals across Poland, recalls the Last Supper, in which Christ washed the feet of his apostles on the eve of his Crucifixion. “We are beginning the three Holy Days in the liturgical year of the Church,” Cardinal Nycz declared. The cardinal added that it is also a day of prayer for those who are preparing to join the priesthood and those who have just begun their vocations. Elsewhere in Poland, scenes from the Passion Play - which portyays the last days of Christ - were enacted at the 17th century Sanctuary of Kalwaria Zebrzrydowska in southern Poland, one of the favoured pilgrimage destinations of the late Polish pontiff, Pope John Paul II. As it traditional, scenes from the Last Supper were played by clergyman. On Good Friday, an enactment of the Crucifixion itself will be staged. Polish Roman Catholics are marking Maundy Thursday, recalling the Last Supper that Christ shared with apostles on the eve of his Crucifixion. 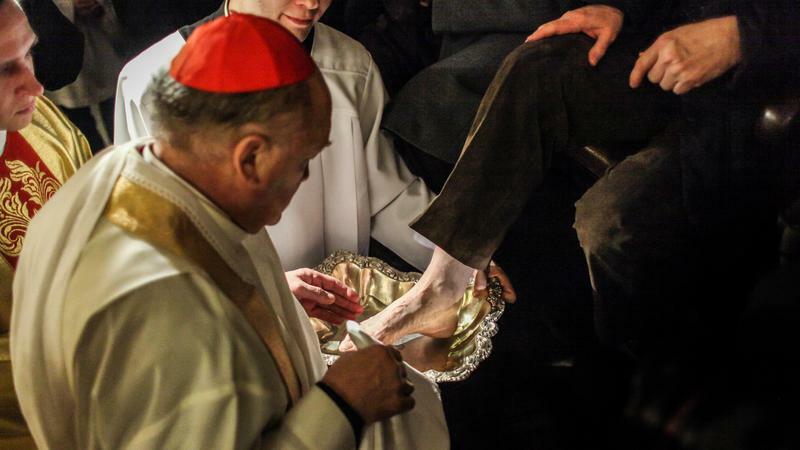 Following custom, Archbishop of Warsaw Cardinal Kazimierz Nycz will wash and kiss the feet of twelve elderly men during a mass at the capital's Cathedral of St John, echoing Christ's gesture to the apostles during the Last Supper. The ritual will be repeated by archbishops across Poland. “This shows the humble nature of the priesthood,” commented Father Jan Maria Szewek. Meanwhile, as critics of the Polish government accuse it of washing its hands of providing asylum for refugees, Pope Francis will wash the feet of 12 asylum-seekers in a gesture of compassion. “His actions mean to tell us that it is important to pay due attention to the weakest in this historic moment; that we are all called to restore their dignity without resorting to subterfuge,” commented Archbishop Rino Fisichella, in an article in the Vatican newspaper, L'Osservatore Romano. The ritual will take place at the Centre for Asylum Seekers in Castelnuovo di Porto, 25 kilometres north of Rome. The 12 asylum-seekers include four Catholics from Nigeria, three Muslims, three Coptic women from Eritrea, and a Hindu from India. In Poland, women may have their feet washed too but on one condition - no tights.